While the early discoveries of Ellerman and Bang and Rous might have predicted that retroviruses would be found associated with human cancers, in fact it was a herpesvirus that was the first viral agent implicated in a human cancer. This was what was called the Epstein-Barr virus – now Human herpesvirus 4 – that was discovered in 1964 by Michael Epstein, Bert Achong and Yvonne Barr in specimens from a Burkitt lymphoma patient sent from Uganda by the surgeon Denis Burkitt. The virus was later implicated in infectious mononucleosis or glandular fever, also known as the “kissing disease” or because it tends to get spread around by intimate contact between college students. The virus is carried by up to 95% of adults worldwide, after mainly asymptomatic infections as children. It is implicated in causing over 95% of nasopharyngeal carcinomas, nearly 50% of Hodgkin lymphoma, and about 10% of gastric carcinomas – for a total of nearly 200 000 cancers worldwide per year. There is still no vaccine, although candidates are in clinical trial. The next virus to be definitively linked to a human cancer was Hepatitis B virus (HBV), that had been discovered more or less accidentally during serological studies in the 1960s by Baruch Blumberg and colleagues. However, a transmissible agent had been implicated in “serum hepatitis” as early as 1885, when A Lurman showed that contaminated lymph (serum) was to blame for an outbreak in a shipyard in Bremen after a smallpox prevention exercise. Subsequently, reuse of hypodermic needles first introduced in 1909 was shown to be responsible for spreading the disease. Blumberg’s “initial discoveries were based primarily on epidemiologic, clinical, and serological observations”; however, by 1968 the “Australia antigen” was seen to consist of 22 nm empty particles, now known to be composed of capsid protein or “surface antigen”, and by 1970 a 42 nm DNA-containing “Dane particle” was found which is now known to be the virion. 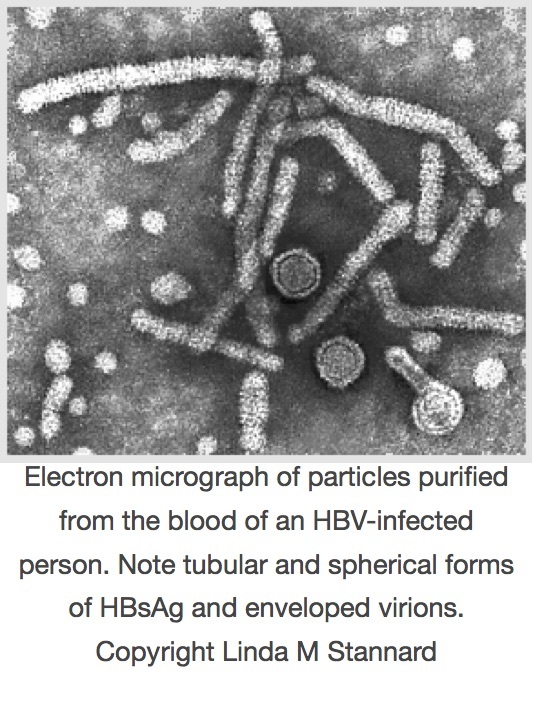 Blumberg had by 1972 patented a vaccine derived by purification of 22 nm particles composed of HBV surface antigen (HBsAg) from donor blood, a process pioneered by Maurice Hilleman. By 1975 Blumberg and others had also implicated HBV in the causation of primary hepatic carcinoma, now known as hepatocellular carcinoma (HCC) and a serious complication of chronic infection with HBV, especially if acquired in early life. The vaccine was licenced for use in 1982, meaning it was the first anti-cancer vaccine, and the first viral subunit vaccine. Blumberg shared the 1976 Nobel Prize in Physiology or Medicine with D Carleton Gajdusek – who described the first prion-caused diseases – for “…their discoveries concerning new mechanisms for the origin and dissemination of infectious diseases”. By 1979 the whole HBV genome had been cloned and sequenced, and molecular biology studies could start in earnest. A recombinant HBsAg produced in yeast was subsequently licenced in 1986, and has supplanted the earlier one. It is being used in a many countries as part of the EPI (Extended Programme of Immunisation) bundle given to infants, as there is more risk of chronic infection the younger the person is that is infected. Given that upwards of 2 billion people have been infected, and the over 300 million people that are chronically infected with HBV have a 15-25% risk of dying prematurely from HBV-related causes, there is the potential to make a very significant impact on liver disease. A technical development that was to greatly advance the study of viruses was begun in 1923, but only reached fruition by the 1930s: this was the ultracentrifuge, invented and developed first by Theodor (“The”) Svedberg in Sweden as a purely analytical tool, and later by JW Beams and EG Pickels in the USA as an analytical and preparative tool. The ultracentrifuge revolutionised first, the physical analysis of proteins in solution, and second, the purification of proteins, viruses and cell components, by allowing centrifugation at speeds high enough to allow pelleting of subcellular fractions. 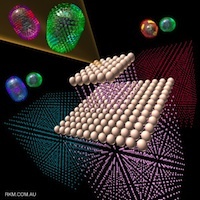 Analytical centrifugation and calculation of molecular weights of particles gave some of the first firm evidence that certain proteins, and virus particles, were large, regular objects. Indeed, it came to be taken as a given that one of the fundamental properties of a virus particle was its sedimentation coefficient, measured in svedbergs (a unit of 10-13 seconds, shown as S20,W). This is also how ribosomes of pro- and eukaryotes came to be named: these are known as 70S (prokaryote) and 80S ribosomes, respectively, based on their different sedimentation rates. In 1931, Robert Shope in the USA managed to recreate swine influenza by intranasal administration of filtered secretions from infected pigs. Moreover, he showed that the classic severe disease required co-inoculation with a bacterium – Haemophilus influenza suis – originally thought to be the only agent. He also pointed out the similarities between the swine disease and the Spanish Flu, where most patients died of secondary infections. However, he also suggested that the virus survived seasonally in a cycle involving the pig, lungworms, and the earthworm, which is now known to be completely wrong. This notwithstanding, he found that people who had survived infection during the 1918 pandemic had antibodies protecting them against the swine flu virus, while people born after 1920 did not, which showed that the 1918 human and swine flu viruses were very similar if not identical. This was a very relevant discovery for what happened much later, in the 2009 influenza pandemic, when the same virus apparently came back into the human population from pigs after circulating in them continuously since 1918. Shope went on in 1932 to discover, with Peyton Rous, what was first called the Shope papillomavirus and later Cottontail rabbit papillomavirus: this causes benign cancers in the form of long hornlike growths on the head and face of the animal. This may explain the sightings in the US Southwest of the near-mythical “jackalope”. Patrick Laidlaw and William Dunkin, working in the UK at the National Institute for Medical Research (NIMR), had by 1929 successfully characterised the agent of canine distemper – a relative of measles, mumps and distemper morbilliviruses – as a virus, proved it infected dogs and ferrets, and in 1931 got a vaccine into production that protected dogs. This was made from chemically inactivated filtered tissue extract from infected animals. Their work built on and completely eclipsed earlier findings, such as those of Henri Carré in France in 1905, who first claimed to have shown it was a filterable agent, and Vittorio Puntoni, who first made a vaccine in Italy from virus-infected brain tissue inactivated with formalin in 1923. Continuing from Laidlaw and Dunkin’s work in the same institute, Christopher Andrewes, Laidlaw and W Smith reported in 1933 that they had isolated a virus from humans infected with influenza from an epidemic then raging. They had done this by infecting ferrets with filtered extracts from infected humans – after the fortuitous observation that ferrets could apparently catch influenza from infected investigators! The “ferret model” was very valuable – see here for modern use of ferrets – as strains of influenza virus could be clinically distinguished from one another. Max Theiler and colleagues in the USA took advantage of the new method of egg culture to adapt the French strain of yellow fever virus (YFV) he had grown in mouse brains to being grown in chick embryos, and showed that he could attenuate the already weakened strain even further – but it remained “neurovirulent”, as it caused encephalitis or brain inflammation in monkeys. He then adapted the first YFV characterised – the Asibi strain, from Ghana in 1927 – to being grown in minced chicken embryos lacking a spinal cord and brain, and showed in 1937 that after more than 89 passages, the virus was no longer “neurotrophic”, and did not cause encephalitis. The new 17D strain of YFV was successfully tested in clinical trials in Brazil in 1938 under the auspices of the Rockefeller Foundation, which has supported YFV work since the 1920s. The strain remains in use today, and is still made in eggs. Given that the nature of viruses had prompted people to think of them as “chemical matter”, researchers had attempted from early days to isolate, purify and characterise the infectious agents. An early achievement was the purification of a poxvirus in 1922 by FO MacCallum and EH Oppenheimer. Much early work was done with bacteriophages and plant viruses, as these were far easier to purify or extract at the concentrations required for analysis, than animal or especially human viruses. “…it is probable that the virus which we have investigated reacted as a chemical substance”. An important set of discoveries started in 1935, when Wendell Stanley in the USA published the first proof that TMV could be crystallised, at the time the most stringent way of purifying molecules. He also reported that the “protein crystals” were contaminated with small amounts of phosphorus. An important finding too, using physical techniques including ultracentrifugation and later, electron microscopy, was that the TMV “protein” had a very high molecular weight, and was in fact composed of large, regular particles. This was a very significant discovery, as it indicated that some viruses at least really were very simple infectious agents indeed. However, his conclusion that TMV was composed only of protein was soon challenged, when Norman Pirie and Frederick Bawden working in the UK showed in 1937 that ribonucleic acid (RNA) – which consists of ribose sugar molecules linked by phosphate groups – could be isolated consistently from crystallised TMV as well as from a number of other plant viruses, which accounted for the phosphorus “contamination”. This resulted in the realisation that TMV and other plant virus particles – now known to be virions – were in fact nucleoproteins, or protein associated with nucleic acid. “Since the original discovery of this infectious, disease-producing agent, known as tobacco mosaic virus, well over three hundred different viruses capable of causing disease in man, animals and plants have been discovered. Among the virus-induced diseases of man are smallpox, yellow fever, dengue fever, poliomyelitis, certain types of encephalitis, measles, mumps, influenza, virus pneumonia and the common cold. Virus diseases of animals include hog cholera, cattle plague, foot-and-mouth disease of cattle, swamp fever of horses, equine encephalitis, rabies, fowl pox, Newcastle disease of chickens, fowl paralysis, and certain benign as well as malignant tumors of rabbits and mice. Plant virus diseases include tobacco mosaic, peach yellows, aster yellows, potato yellow dwarf, alfalfa mosaic, curly top of sugar beets, tomato spotted wilt, tomato bushy stunt, corn mosaic, cucumber mosaic, and sugar cane yellow stripe. Bacteriophages, which are agents capable of causing the lysis of bacteria, are now regarded as viruses”. Two of the most interesting things about the article, however, are the electron micrographs of virus particles – Stanley had one of the first electron micrsoscopes available at the time – and the table of sizes of viruses, proteins and cells that had been determined by then by techniques such as ultracentrifugation and filtration: TMV was known to be rodlike, 15 x 280 nm; vaccinia was 210 x 260 nm; poliomyelitis was 25 nm; phages like T2 were known to have a head-and-tail structure. 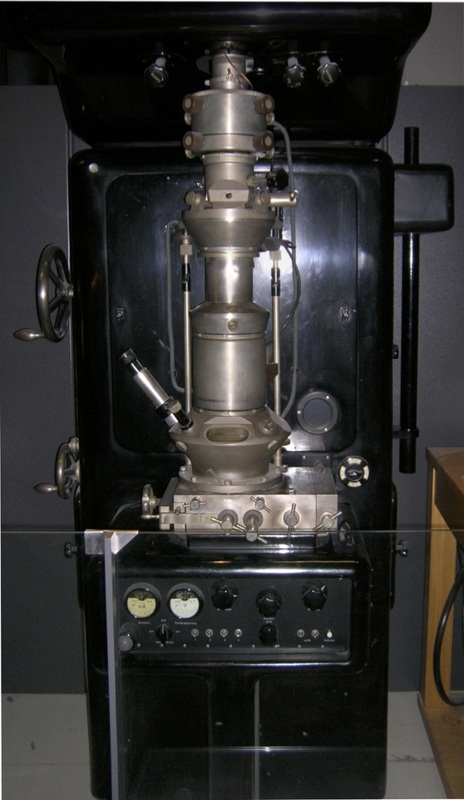 The development of the electron microscope, in Germany in the 1930s, represented a revolution in the investigation of virus structures: while virions of viruses like variola and vaccinia could just about be seen by light microscopy – and had been, as early as 1887 by John Buist and others – most viruses were far too small to be visualised in this way. While Ernst Ruska received a Nobel Prize in 1986 for developing the electron microscope, it was his brother Helmut who first imaged virus particles – using beams of electrons deflected off virus particles coated in heavy metal atoms. From 1938 through the early 1940s, using his “supermicroscope”, he imaged virions of poxviruses, TMV, varicella-zoster herpesvirus, and bacteriophages, and showed that they were all particulate – that is, they consisted of regular and sometimes complex particles, and were often very different from one another. He even proposed in 1943 a system of viral classification on the basis of their perceived structure. While electron microscopy was also used medically to some extent thereafter – for example, in differentiating smallpox from chickenpox by imaging particles of variola virus and varicella-zoster virus, respectively, derived from patients’ vesicles – its use was limited by the expense and cumbersome nature of sample preparation. For example, the micrographs in Stanley’s 1946 paper were all done with samples “…prepared with gold by the shadow-casting technique”. The use of the cumbersome technique of metal shadow-casting, and the highly inconvenient nature of electron microscopy as a routine tool all changed from 1959 onwards, when Sydney Brenner and Robert Horne published “A negative staining method for high resolution electron microscopy of viruses”. This method involves the use of viruses in liquid samples deposited on carbon-coated metal grids, and then stained with heavy-metal salts such as phosphotungstic acid (PTA) or uranyl acetate. This simple technique revolutionised the field of electron microscopy, and within just a few years much information was acquired about the architecture of virus particles. Not only were the overall shapes of particles revealed, but also the details of the symmetrical arrangement of their components. Some beautiful examples can be seen here, at the Cold Spring Harbor site. Depiction of the effects of using a heavy metal salt solution to negatively stain particles on a carbon film. The stain (dark) pools around the particles (light). Human rotavirus particles, stained from below (left) and by immersion (right). When dinner could kill you: smoked chimpanzee, anyone? The global trade in wildlife has historically contributed to the emergence and spread of infectious diseases. The United States is the world’s largest importer of wildlife and wildlife products, yet minimal pathogen surveillance has precluded assessment of the health risks posed by this practice. This report details the findings of a pilot project to establish surveillance methodology for zoonotic agents in confiscated wildlife products. Initial findings from samples collected at several international airports identified parts originating from nonhuman primate (NHP) and rodent species, including baboon, chimpanzee, mangabey, guenon, green monkey, cane rat and rat. Pathogen screening identified retroviruses (simian foamy virus) and/or herpesviruses (cytomegalovirus and lymphocryptovirus) in the NHP samples. 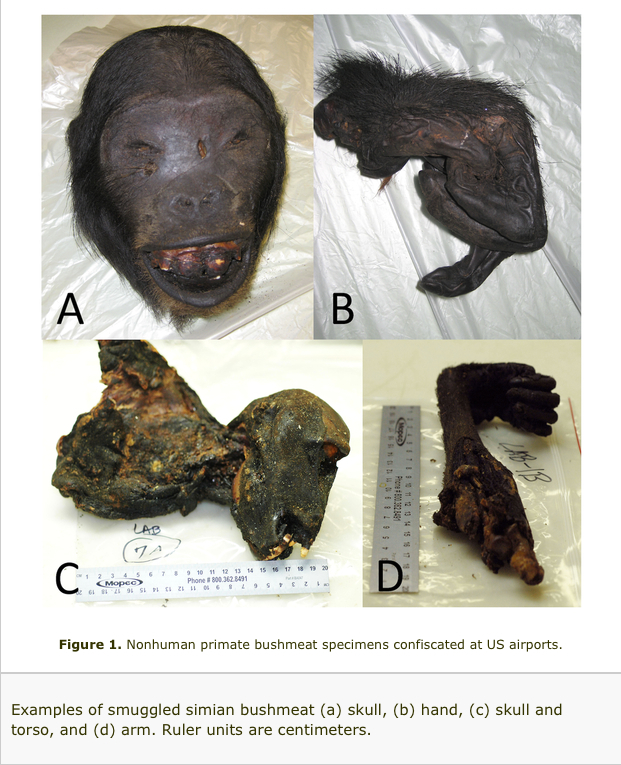 These results are the first demonstration that illegal bushmeat importation into the United States could act as a conduit for pathogen spread, and suggest that implementation of disease surveillance of the wildlife trade will help facilitate prevention of disease emergence. What was even more horrifying were the pictures of confiscated items – herewith their Figure 1. It boggles my mind how anyone could even consider smuggling this sort of thing into anywhere – and I am hoping that the US Customs has the same sorts of detection mechanism – as in, well-trained beagles – as they used to have in Miami Airport to detect biltong [dried spiced meat] smuggled in from South Africa. Those dogs were seriously good – trouble is, they really loved the biltong they got as a reward, too, and it makes my skin crawl rather to imagine a beagle salivating over smoked vervet monkey. No one really knows the scale of the illegal trade in wildlife meat, or bushmeat as it is often called, but a 2010 study estimated that 5 tonnes of the material per week was being smuggled in personal baggage through Roissy-Charles de Gaulle airport in Paris, France. And in addition to the meat products, there is a big trade in live wild animals. Much of this is perfectly legal and supplies the pet industry. Nonetheless, these animals also require improved pathogen surveillance, say the researchers. One has only to remember that the monkeypox outbreak in the USA in recent times originated in an African animal imported live – see Viroblogy here – to realise the potential danger posed by international movement of wild-caught animals – or even of laboratory animals, as happened in the Ebola Reston incident. So really, it is just a matter of time before meat that contains SIVs or STLVs gets through into the USA and other world centres – and a whole new wave of zoonotic infection could start. It really is inexcusable that people living in developed countries should be importing meat derived from endangered species in the first place. It is made worse that developed countries like the USA find it necessary to import LIVE animals as pets – and while the monkeypox outbreak was caught early, the next one may not be. So forget the “engineered” H5N1 paranoia, folks – be a LOT more scared of the cute rodent in a cage near you, or what your neighbour may be eating…. Do corals get stress headaches? The large DNA viruses – pox-, irido-, herpes-, asfar-, mimi- and baculoviruses and their ilk – have a deep and possibly complex evolutionary history, and there is considerable evidence to suggest long histories of co-speciation with host lineages. Indeed, the herpesviruses – including those of particular interest to humans , 1 and 2 and varicella-zoster (chickenpox) and 8 (associated with Kaposi’s sarcoma) – seem to have co-speciated along with vertebrates, with human and simian cytomegaloviruses, for example. During the last several decades corals have been in decline and at least one-third of all coral species are now threatened with extinction. Coral disease has been a major contributor to this threat, but little is known about the responsible pathogens. To date most research has focused on bacterial and fungal diseases; however, viruses may also be important for coral health. Using a combination of empirical viral metagenomics and real-time PCR, we show that Porites compressa corals contain a suite of eukaryotic viruses, many related to the Herpesviridae. This coral-associated viral consortium was found to shift in response to abiotic stressors. In particular, when exposed to reduced pH, elevated nutrients, and thermal stress, the abundance of herpes-like viral sequences rapidly increased in 2 separate experiments. Herpes-like viral sequences were rarely detected in apparently healthy corals, but were abundant in a majority of stressed samples. In addition, surveys of the Nematostella and Hydra genomic projects demonstrate that even distantly related Cnidarians contain numerous herpes-like viral genes, likely as a result of latent or endogenous viral infection. These data support the hypotheses that corals experience viral infections, which are exacerbated by stress, and that herpes-like viruses are common in Cnidarians. Basically, they purified virus-sized particles from seawater, extracted DNA, verified there was no cellular DNA present (by PCR for 16S and 18S rDNA), and amplified the viral DNA using a GenomiPhi phi29 plymerase-based genome amplification kit from GE Healthcare, and sent to 454 Life Sciences for pyrosequencing. What came back was obviously a mountain of sequence data – which was archived at the San Diego State Center for Universal Microbial Sequencing – and then analysed for contigs or assemblable runs of sequences which looked like herpesvirus or other genomes. The supplemental data to this paper gives a relationship dendrogram – which isn’t that informative, as it contains just one coral thymidylate kinase sequence, and that is grouped within a clade with human viruses with other vertebrate herpesviruses outside of those. The metagenomic and temporal experiments presented here demonstrate that exposure to stressors results in the production of a herpes-like virus or a consortium of herpes-like viruses in P. compressa corals. Thermal stress, eutrophication, and decreasing seawater pH have each been shown to disrupt coral health. Increases in sea surface temperature causes coral bleaching and increased coral disease incidence (58, 59). Nutrient addition exacerbates coral diseases, and reduced pH results in loss of corallite deposition (60, 61). This study demonstrates that, in addition to symbiont loss and bacterial and fungal disease (62), temperature and nutrient elevation and pH reduction result in increased HLV production. Herpesviruses typically infect nervous tissue, and it is tempting to suggest that the herpes-like viruses in Cnidarians may have ancient origins, because Cnidarians are the first metazoans to develop rudimentary nervous systems…. So be kind to our poor fronded friends…they may be our close cousins in discomfort when stressed. Virus origins: from what did viruses evolve or how did they initially arise? This was originally written as an Answer to a Question posted to Scientific American Online; however, as what they published was considerably shorter and simpler than what I wrote, I shall post the [now updated] original here. The answer to this question is not simple, because, while viruses all share the characteristics of being obligate intracellular parasites which use host cell machinery to make their components which then self-assemble to make particles which contain their genomes, they most definitely do not have a single origin, and indeed their origins may be spread out over a considerable period of geological and evolutionary time. Viruses infect all types of cellular organisms, from Bacteria through Archaea to Eukarya; from E. coli to mushrooms; from amoebae to human beings – and virus particles may even be the single most abundant and varied organisms on the planet, given their abundance in all the waters of all the seas of planet Earth. Given this diversity and abundance, and the propensity of viruses to swap and share successful modules between very different lineages and to pick up bits of genome from their hosts, it is very difficult to speculate sensibly on their deep origins – but I shall outline some of the probable evolutionary scenarios. The graphic depicts a possible scenario for the evolution of viruses: “wild” genetic elements could have escaped, or even been the agents for transfer of genetic information between, both RNA-containing and DNA-containing “protocells”, to provide the precursors of retroelements and of RNA and DNA viruses. 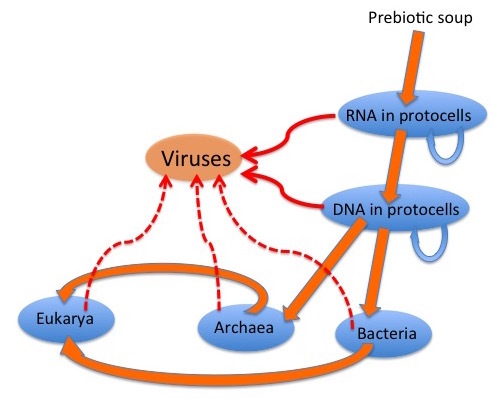 Later escapes from Bacteria, Archaea and their progeny Eukarya would complete the virus zoo. It is generally accepted that many viruses have their origins as “escapees” from cells; rogue bits of nucleic acid that have taken the autonomy already characteristic of certain cellular genome components to a new level. Simple RNA viruses are a good example of these: their genetic structure is far too simple for them to be degenerate cells; indeed, many resemble renegade messenger RNAs in their simplicity. What they have in common is a strategy which involves use of a virus-encoded RNA-dependent RNA polymerase (RdRp) or replicase to replicate RNA genomes – a process which does not occur in cells, although most eukaryotes so far investigated do have RdRp-like enzymes involved in regulation of gene expression and resistance to viruses. The surmise is that in some instances, an RdRp-encoding element could have became autonomous – or independent of DNA – by encoding its own replicase, and then acquired structural protein-encoding sequences by recombination, to become wholly autonomous and potentially infectious. A useful example is the viruses sometimes referred to as the “Picornavirus-like” and “Sindbis virus-like” supergroups of ssRNA+ viruses, respectively. These two sets of viruses can be neatly divided into two groups according to their RdRp affinities, which determine how they replicate. However, they can also be divided according to their capsid protein affinities, which is where it is obvious that the phenomenon the late Rob Goldbach termed “cassette evolution” has occurred: some viruses that are relatively closely related in terms of RdRp and other non-structural protein sequences have completely different capsid proteins and particle morphologies, due to acquisition by the same RdRp module of different structural protein modules. Given the very significant diversity in these sorts of viruses, it is quite possible that this has happened a number of times in the evolution of cellular organisms on this planet – and that some single-stranded RNA viruses like bacterial RNA viruses or bacteriophages and some plant viruses (like Tobacco mosaic virus, TMV) may be very ancient indeed. However, other ssRNA viruses – such as the negative sense mononegaviruses, Order Mononegavirales, which includes the families Bornaviridae, Rhabdoviridae, Filoviridae and Paramyxoviridae, represented by Borna disease virus, rabies virus, Zaire Ebola virus, and measles and mumps viruses respectively – may be evolutionarily much younger. In this latter case, the viruses all have the same basic genome with genes in the same order and helical nucleocapsids within differently-shaped enveloped particles. Their host ranges also indicate that they originated in insects: the ones with more than one phylum of host either infect vertebrates and insects or plants and insects, while some infect insects only, or only vertebrates – indicating an evolutionary origin in insects, and a subsequent evolutionary divergence in them and in their feeding targets. The ssRNA retroviruses – like HIV – are another good example of possible cell-derived viruses, as many of these have a very similar genetic structure to elements which appear to be integral parts of cell genomes – termed retrotransposons – and share the peculiar property of replicating their genomes via a pathway which goes from single-stranded RNA through double-stranded DNA (reverse transcription) and back again, and yet have become infectious. They can go full circle, incidentally, by permanently becoming part of the cell genome by insertion into germ-line cells – so that they are then inherited as “endogenous retroviruses“, which can be used as evolutionary markers for species divergence. Indeed, there is a whole extended family of reverse-transcribing mobile genetic elements in organisms ranging from bacteria all the way through to plants, insects and vertebrates, indicating a very ancient evolutionary origin indeed – and which includes two completely different groups of double-standed DNA viruses, the vertebrate-infecting hepadnaviruses or hepatitis B virus-like group, and the plant-infecting badna- and caulimoviruses. These are two families of long terminal repeat-containing (LTR) retrotransposons, with different genetic organisations. Members of family Pseudoviridae, also known as Ty1/copia elements, have polygenic genomes of 5-9 kb ssRNA which encode a retrovirus-like Gag-type protein, and a polyprotein with protease (PR), integrase (IN) and reverse transcriptase / RNAse H (RT) domains, in that order. While some members also encode an env-like ORF, the 30-40 nm particles that are an essential replication intermediate have no envelope or Env protein. They are not infectious. Host species include yeasts, insects, plants and algae. Metaviruses – family Metaviridae – are also known as Ty3-gypsy elements, and have ssRNA genomes of 4-10 kb in length. They replicate via particles 45-100 nm in diameter composed of Gag-type protein, and some species have envelopes and associated Env proteins. Gene order in the genomes is Gag-PR-RT-IN-(Env), as for retroviruses. One virus – Drosophila melanogaster Gypsy virus – is infectious; however, as for pseudoviruses, most are not. The genomes have been found in all lineages of eukaryotes so far studied in sufficient detail. 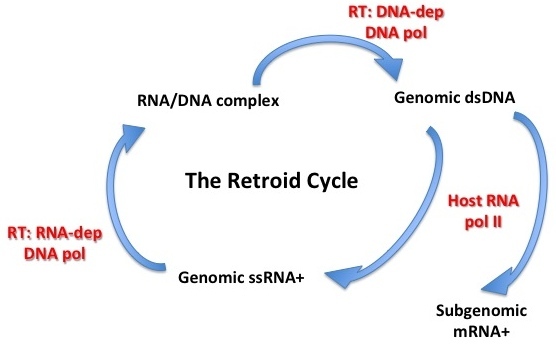 Both pseudovirus and metavirus genomes are clearly related to classic retroviruses; moreover, RT sequences point to metavirus RTs being most closely related to plant DNA pararetrovirus lineage of caulimoviruses. 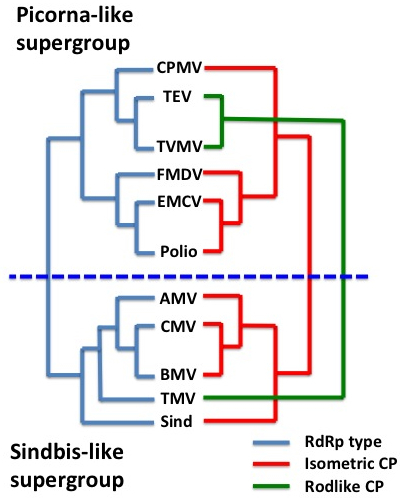 This gives rise to the speculation that pseudoviruses and metaviruses have a common and ancient ancestor – and that two different metavirus lineages gave rise to retroviruses and caulimoviruses respectively. All of these cellular elements and viruses have in common a “reverse transcriptase” or RNA-dependent DNA polymerase, which may in fact be an evolutionary link back to the postulated “RNA world” at the dawn of evolutionary history, when the only extant genomes were composed of RNA, and probably double-stranded RNA. Thus, a part of what could be a very primitive machinery indeed has survived into very different nucleic acid lineages, some viral and many wholly cellular in nature, from bacteria through to higher eukaryotes. The possibility that certain non-retro RNA viruses can actually insert bits of themselves by obscure mechanisms into host cell genomes – and afford them protection against future infection – complicates the issue rather, by reversing the canonical flow of genetic material. This may have been happening over aeons of evolutionary time, and to have involved hosts and viruses as diverse as plants (integrated poty– and geminivirus sequences), honeybees (integrated Israeli bee paralysis virus) – and the recent discovery of “…integrated filovirus-like elements in the genomes of bats, rodents, shrews, tenrecs and marsupials…” which, in the case of mammals, transcribed fragments “…homologous to a fragment of the filovirus genome whose expression is known to interfere with the assembly of Ebolavirus”. There are also obvious similarities in mode of replication between a family of elements which include bacterial plasmids, bacterial single-strand DNA viruses, and viruses of eukaryotes which include geminiviruses and nanoviruses of plants, parvoviruses of insects and vertebrates, and circoviruses and anelloviruses of vertebrates. 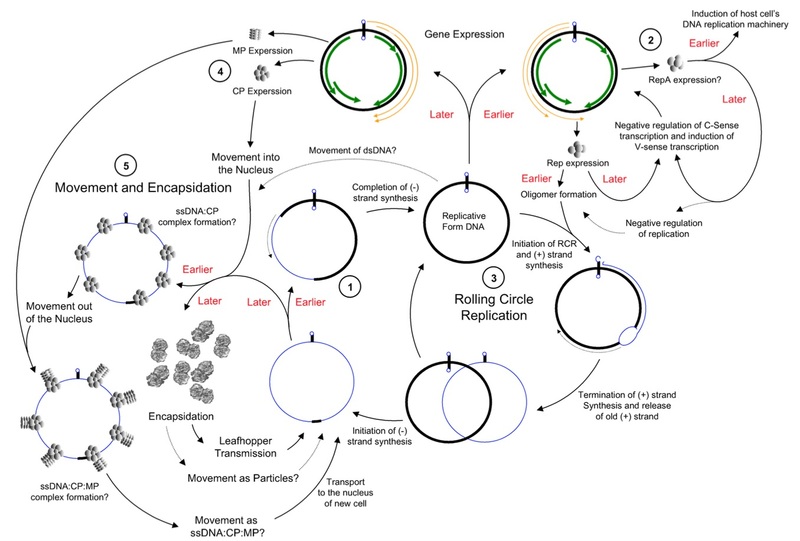 These agents all share a “rolling circle” DNA replication mechanism, with replication-associated proteins and DNA sequence motifs that appear similar enough to be evolutionarily related – and again demonstrate a continuum from the cell-associated and cell-dependent plasmids through to the completely autonomous agents such as relatively simple but ancient bacterial and eukaryote viruses. However, there are a significant number of viruses with large DNA genomes for which an origin as cell-derived subcomponents is not as obvious. In fact, one of the largest viruses yet discovered – mimivirus, with a genome size of greater than 1 million base pairs of DNA – have genomes which are larger and more complex than those of obligately parasitic bacteria such as Mycoplasma genitalium (around 0.5 million), despite their sharing the life habits of tiny viruses like canine parvovirus (0.005 million, or 5000 bases). 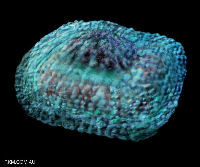 Mimivirus has been joined, since its discovery in 2003, by Megavirus (2011; 1.2 Mbp) and now Pandoravirus (2013; 1.9 -2.5 Mbp). The nucleocytoplasmic large DNA viruses or NCLDVs – including pox-, irido-, asfar-, phyco-, mimi-, mega- and pandoraviruses, among others – have been grouped as the proposed Order Megavirales, and it is proposed that they evolved, and started to diverge, before the evolutionary separation of eukaryotes into their present groupings. It is a striking fact that the largest viral DNA genomes so far characterised seem to infect primitive eukaryotes such as amoebae and simple marine algae – and they and other large DNA viruses like pox- and herpesviruses seem to be related to cellular DNA sequences only at a level close to the base of the “tree of life”. Variola virus, the agent of smallpox. Image courtesy Russell Kightley Media. This indicates a very ancient origin or set of origins for these viruses, which may conceivably have been as obligately parasitic cellular lifeforms which then made the final adaptation to the “virus lifestyle”. However, their actual origin could be in an even more complex interaction with early cellular lifeforms, given that viruses may well be responsible for very significant episodes of evolutionary change in cellular life, all the way from the origin of eukaryotes through to the much more recent evolution of placental mammals. In fact, there is informed speculation as to the possibility of viruses having significantly influenced the evolution of eukaryotes as a cognate group of organisms, including the possibility that a large DNA virus may have been the first cellular nucleus. In summary, viruses are as much a concept as a unitary entity: all viruses have in common, given their polyphyletic origins, is a base-level strategy for replicating their genomes. Otherwise, their origins are possibly as varied as their genomes, and may remain forever obscure. 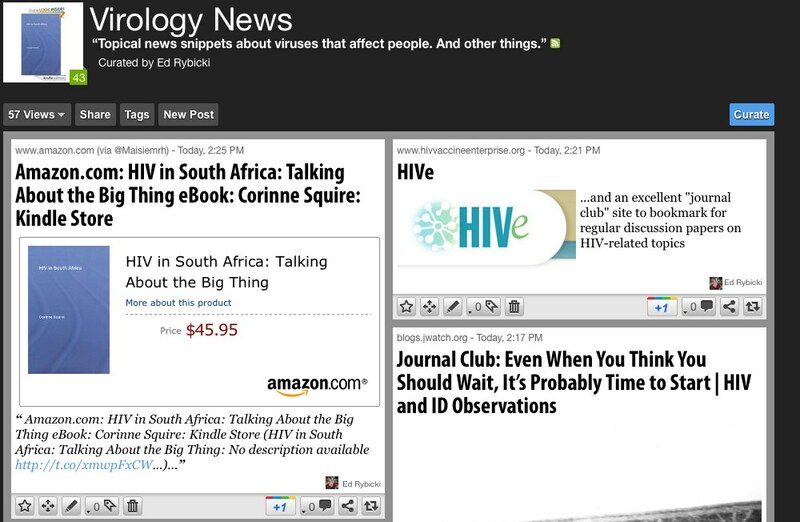 I am indebted to Russell Kightley for use of his excellent virus images.